The Joseph Smith Memorial Building Underground Parking has a in-street entrance is on South Temple street. Please enter west-bound on South Temple. As you turn onto South Temple, the entrance is on the left. At the bottom of the ramp, turn right to enter the Joseph Smith Memorial Building garage. 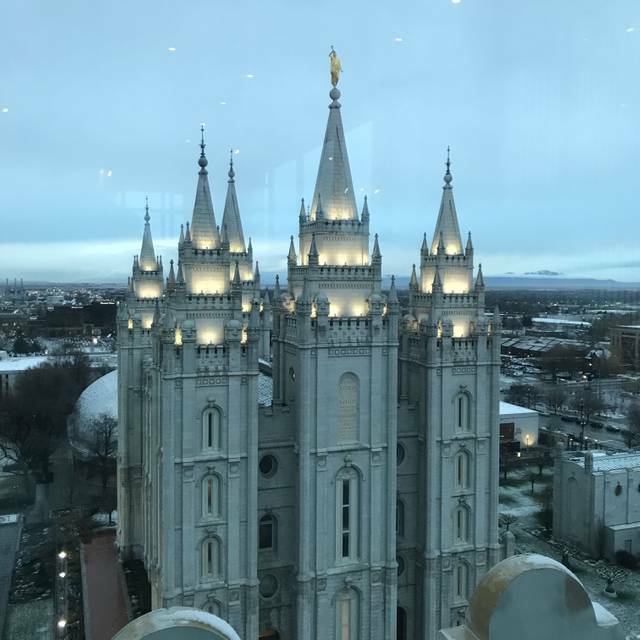 The City Center Stop on the Trax Blue-Line is within a 3-minute walking distance to the Joseph Smith Memorial Building. Live piano music every night and during select daytime special event openings. 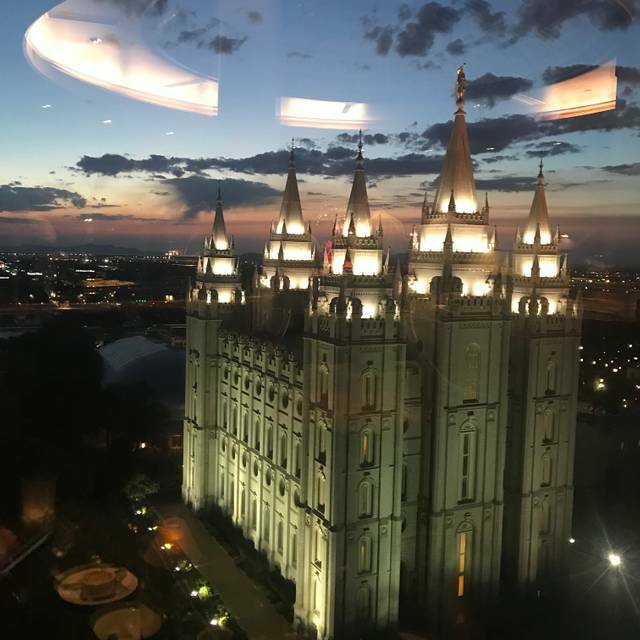 The Roof Restaurant is Utah’s premier gourmet dining buffet, located on the 10th floor of the Joseph Smith Memorial Building in the heart of downtown Salt Lake City. Our menu includes our renowned dessert buffet and exciting international cuisine along with traditional favorites that change monthly. Reservations are recommended. Call ahead to experience gourmet dining you’re sure to remember. Note: no alcohol or coffee is served. Everything was great tasting but disappointed that the whipped honey butter for the rolls were no longer being served and that’s one of the best parts. We had the most amazing waiter!! I travel a lot and go to fine dining all over and this waiter made the experience everything!! He was amazing! Food is always ok, not amazing but good. View is amazing . Took our 16 year ld granddaughter for her birthday. We had a lovely time. Everything at the Roof Restaurant is perfect, elegant and tasty. Great place for special occasions. The live piano music adds to the experience. The view is breath taking. The service is superb. Gorgeous views, but the food is just ok. Buffet could be better. It's good for a one time special event, but I wouldn't dine there regularly unless the food improves. Thank you for taking the time to review our restaurant. We are pleased to hear about your experience. We hope to see you again in the near future! The evening was very pleasant. Our server, Allison, was wonderful. All staff were very accommodating. It was prom night, with dozens of young people, so the noise level was loud, but not unpleasant. Beck, the pianist played throughout and was very good. The roof was absolutely amazing...the food was delicious and Dereck was awesome as a server. The atmosphere in the restaurant was one of elegance yet still fun! We love the atmosphere of The Roof and that the food is so good! It’s great to be able to try a variety of gourmet foods during one meal. Our server was so knowledgeable and on top of everything we may need. Will be going back for sure! My wife come for the ambiance and the salmon. We were very dissappointed there was no salmon. First time in years we haven't seen the salmon. Everything was great. Highly recommend The Roof. Wonderful experience! 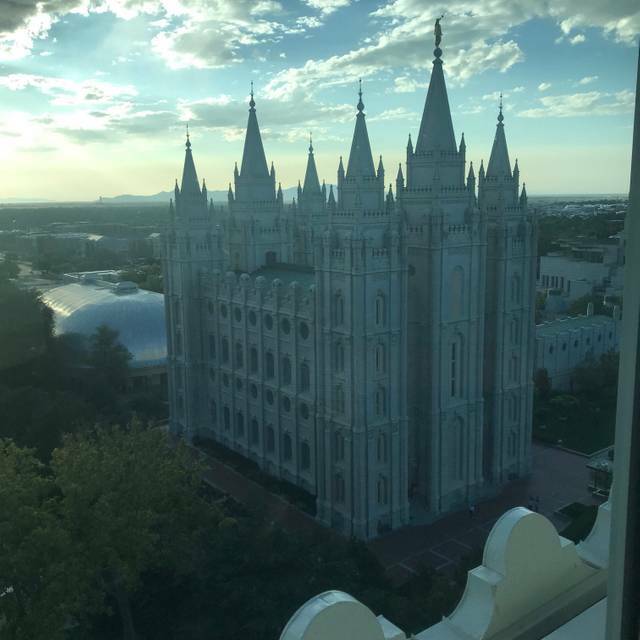 They were able to accommodate us with a view of the Temple per our request, as it was our anniversary. Food was great, service excellent. Thank you! Wonderful! Can’t wait to go back! Food was excellent, loved the steak and mint chocolate cake! One of the best restaurants in SLC! You can't beat the location, view, ambiance and variety of delicious food. I booked our table for four people. I was taking my two grandson's who just received the Aaronic Priesthood. Our reservation was at 12:30 pm. When I arrived I was told that they did not have a table for four people, even though I had reserved one. I was told we could wait for a table but it would take some time before one would be available. They offered me two window tables, each only holding 2 people. My goal was to have an adult type dinner with my two grandson's, instead my grandboys wanted to eat together and we didn't have the experience that I had planned. I was very disappointed!! I have eaten at The Roof many times. When I placed my reservation I was never told that it was only a "lunch style" buffet. I was looking forward to the great food I had always had in the past. I could have gone to any other sandwich shop or even The Garden across the hall and had the same type of meal for a less expensive price. So very disappointed in our experience!! Excellent Food with a tremendous view at the temple. High Value for the Price. I love that place..the sevice, food and the view are the best!!! 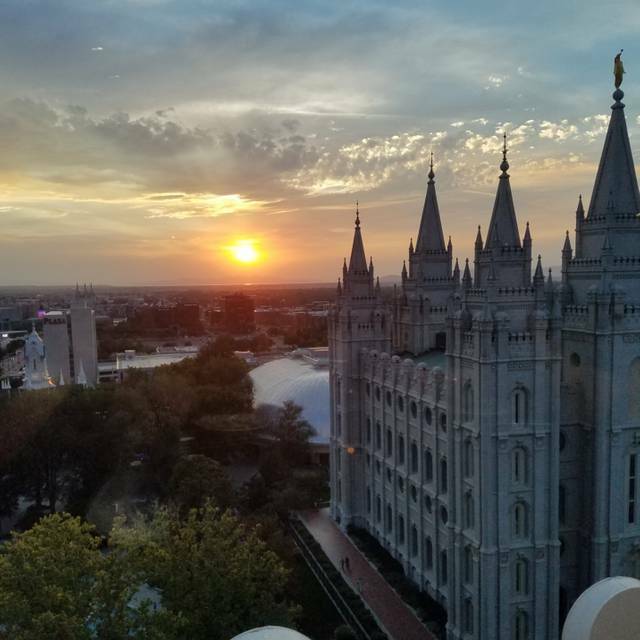 Beautiful view of Salt Lake City from the 10th floor. The buffet is delicious. Piano is a nice touch. We went to The Roof to celebrate my wife's birthday. The staff was incredible! They personalized the experience to us beyond what we expected. The view was incredible, and the piano player made the atmosphere was fun. The food was amazing! I definitely ate more than I should, but I couldn't help myself because it was so delicious. While the food was decent and much better than a typical buffet, I do not feel the value for the money is very good. The special that night was NY Steak, and it was all cooked on the well done side which made it not very enjoyable. The prime rib, while tasty, was also on the verge of being over cooked. The highlight was the rolls. We absolutely love this place! It is a little more spendy than most places but it is so so worth it!! Definitely a break from the norm to celebrate a special occasion. Great atmosphere, beautiful piano music with a talented pianist. Food was good and the customer service was outstanding. Our party had a good time. The place has a nice ambience and beautil views. Food in general was really good, except for the New York steaks which were rather dry and a little hard. Desserts were outstanding. All in all a very good experience. I would certainly recommend it. Mormon motif throughout the restaurant, doesn't serve beer/wine/booze, but excellent otherwise. Food was amazing, excellent selection. Service was wonderful. 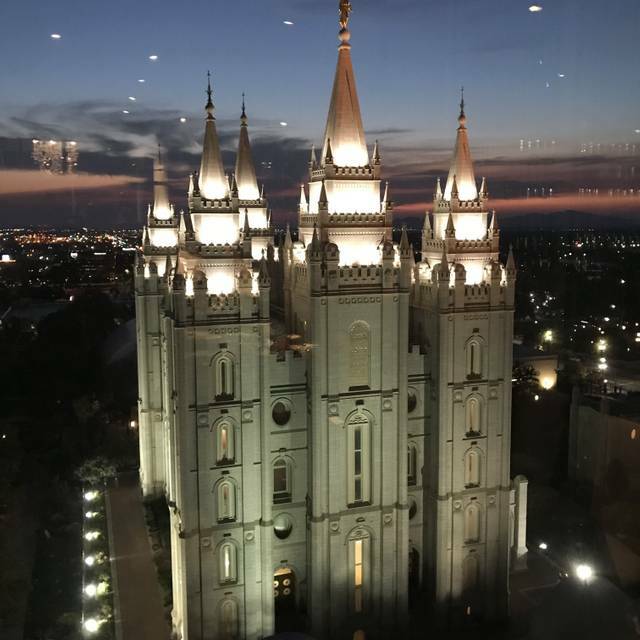 Live piano music and spectacular view made for a great evening. I spent ALOT of money on good, but very limited food. Service was great but ambiance was lacking. 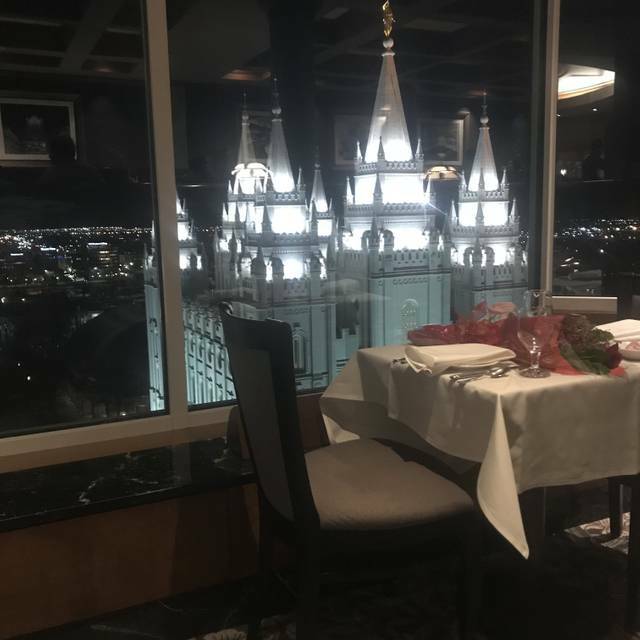 I also made a reservation and asked for, and was promised, a certain view with flowers and a special note...they didn't deliver and it was very disappointing. I dont think I will go back. This is a great place to celebrate an anniversary or special occasion. We love The Roof and will return, however, this visit was less than we expected. The salad bars seem to have less choices, there wasn't any other choice besides Prime Rib and before there was Ham. Everything seemed to have pepper on it, which I do not like. 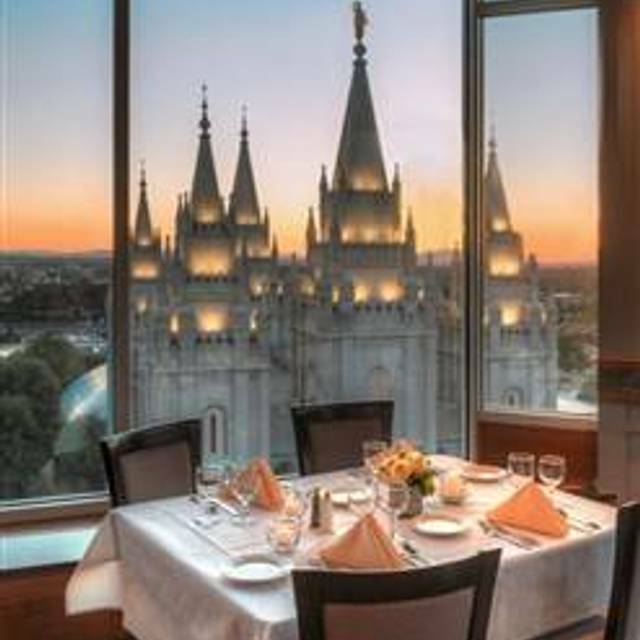 The service was impeccable as usual, the rolls were fabulous and the view was unbeatable. Always a wonderful experience. One could learn a lot about how to be a proper server by watching the impeccable service ar The Roof. If you drive a bigger vehicle or intend to stay more than 3 hours you're better off parking at City Creek than The Joseph Smith Building. I would not recommend this as a restaurant for children, even if you can afford it. One need not pile their plate high and deep nor make a dozen trips simply because the food is presented buffet style. You'll never find a better view nor more romantic restaurant. It was out first time there!! We were very happy with our experience. We would do it all over again! We loved our experience at the Roof Top. I have only been to The Roof once before. I had a great time then and this time as well. 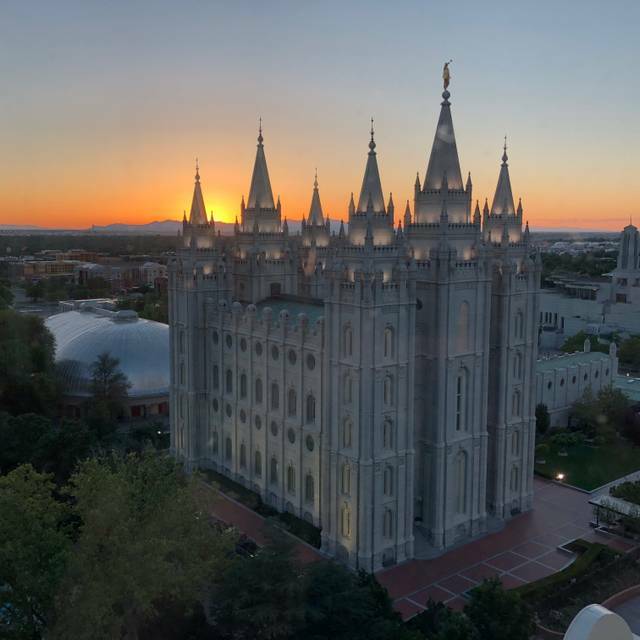 Being able to sit down and look out the window and see the temple and the Sunset is amazing. Best time is when they light up the trees during the holidays at the temple. Magical!! The food is amazing. The options are limited to what you would expect at a buffet, however, the quality makes up for the quantity. The selection of meats are mouth watering. the salads and anti-pasta compliment perfectly. Desserts!!! Finally, listening to the pianist rounds out the ambiance. It definitely set the tone for an amazing dinner. Our party of 5 was extremely satisfied with our dining experience. 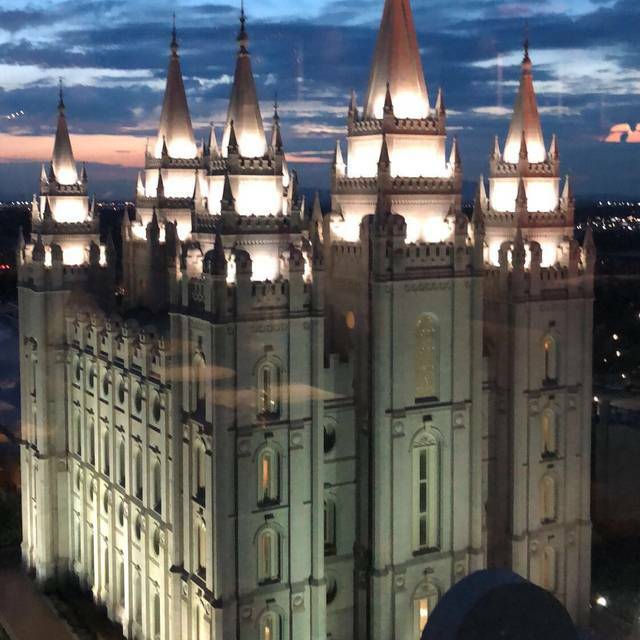 We had a great table with lots of light & wonderful view of the Temple. The food was delicious with lots of variety. No feeling of being rushed, nice background music. Couldn’t have been better. THANK YOU!!! Wonderful view and service. The food is always Delicious and they always have a wide array of foods to choose from. The live piano music is also so wonderful to sit and listen to. We really enjoy our experience every time we go. Everything was perfect! Will definitely be going back. My husband and I went here and enjoyed it. We do plan to go back. They are accomodating and helpful. The service was good. It was not to the level of crumbing the table and ensuring we had clean silverware but it was nice. It’s a good date place or would be good for business meals. Wish the napkins weren’t folded every time you leave the table.